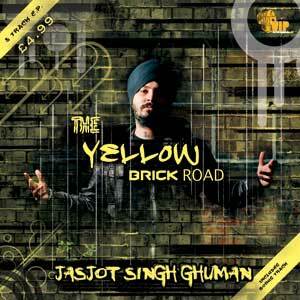 Jasjot Singh Ghuman brings us his debut E.P “The Yellow Brick Road” under the management of VIP Records. The E.P offers 4 brand new songs and a bonus song “Vaisakhi Mela”, which was the first time avid listeners and the mass audience, were exposed to this raw talent. The E.P features a trio of producers, all of whom have given their unique signature stamp on the tracks that they have produced. The talents of widely acclaimed producers such as Jeeti and Kaos Productions are on show, whilst the E.P also introduces the talents of an up and coming producer from London – AV. The debut presentation from Jasjot Singh demonstrates his undoubted vocal ability accompanied by a selection of songs which bring a summer party vibe to the table. Once again, Jeeti unveils his musical prowess on the mega track “Majajan Boliyan” which is set to be a dance floor hit. Kaos also flaunt their expansive style of music production with a reggae twist on the song “Ford”, providing a song that is sure to be a favourite on the playlist when cruising in your car on a hot summer afternoon. “The Yellow Brick Road” delivers the first steps in Jasjot Singh’s musical journey, with more tracks in the pipeline and an album to follow; this British Panjabi talent is one to keep an eye on. Can’t wait. Have been waiting for a follow up track from this guy for ages and now it looks like it was worth the wait. Video looks phat and sounding Sik! For once a newcomer who can actually sing. Looking and sounding good. Hailing is the next super star with his own image big up Jasjot from West London, at least someone who can actually sing coming from the Southall, Hayes endz. Big UP!! !